Morningstar is continuously striving to maintain the highest levels of innovation, R&D and engineering excellence. Morningstar is renowned for delivering the industry’s best overall customer value. 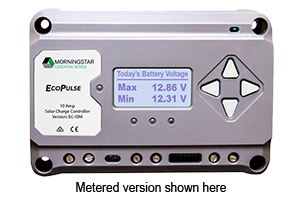 Our controllers & inverters have set new standards in performance, innovative features, quality & reliability. Our products are manufactured in a fully automated world-class ISO 9001 facility. Our Quality Control includes 100% functional testing on every product, using the latest computerized test equipment and processes. Morningstar is continuously striving to maintain a high-level of innovation, R&D and engineering excellence. As part of our commitment to designing and building the industry’s best-in-class products, we have consistently invested in strengthening our R&D capabilities and staffing. Furthermore, we hold several advanced technology & manufacturing process patents that set our products apart from the competition in quality, reliability, performance and above industry average operating life.